I love to try new ways to enhance my enjoyment of my favorite whiskeys. Early on, I was introduced to the water dropper method of adding water to my glass of whiskey to break up the sugars and lactones, releasing the natural aromas and flavors of the whiskey. It was surprising to me that the simple chemistry of adding water could create such noticeable effects on the experience. found that in my favorite bourbons, adding ice (or any method of cooling the whiskey) retarded my experience of the light flavors such as vanilla, caramel, and honey. My preference is to drink my whiskey neat, with water on the side to cleanse my palette. Now I am playing with the effect that air has on my whiskey. Much like its impact on wine, the process of introducing air to your whiskey creates chemical reactions that change the taste. Introducing air can be accomplished with an act as simple as swirling your whiskey in your glass. Try this and hold the glass to your nose. Smell what the introduction of air is releasing. I have also read (but have not yet tried it myself) of the process of pouring half of your bottle of whiskey into an empty bottle and shaking it to create a dynamic introduction of air. One method I have just now tried is the use of an aerator to introduce air into my whiskey. Specifically, the product I experimented with is the Domestik Adjustable Wine & Spirits Aerator. The basic idea of any aerator is to quickly introduce air into the wine or spirit. I have tried both red wine and whiskey with some interesting results. As the whiskey pours through the aerator it is mixed up and air is introduced. The molecules are agitated and separated in a reaction with the air and motion. Some say it makes it easier to detect flavors and aromas and smooths the whiskey. What I initially found was that the Domestik Aerator was incredibly easy to use and adjust and had a noticeable effect on my whiskey, it is a quality product and the fact that it adjusts makes it very versatile, eliminating the need for multiple aerators for wines and spirits. In my blind taste test, I found that the whiskey that passed through the aerator was noticeably smoother, similar to a blended whiskey. My theory on this is that the aerator quickly creates a faster evaporation of alcohol. This mixing and evaporation have a blending effect producing a mellower taste. The aromas, I felt, were less distinguishable. It is possible that this evaporated alcohol (still in the air in the glass) interfered with my ability to detect the aromas that I enjoyed in the non-aerated sample. Perhaps giving it a little time would return the aromas to the glass. I’ll have to try this. My experience was thought-provoking enough that I have added this product to my toolbox for drinking whiskey. I am very interested in further experimentation with this device and, in particular, trying it with certain cask-strength bourbons and high-ABV scotches to see if it improves my enjoyment. If you are like me and enjoy “playing” with your whiskeys to bring out a variety of experiences, you may want to try an aerator. 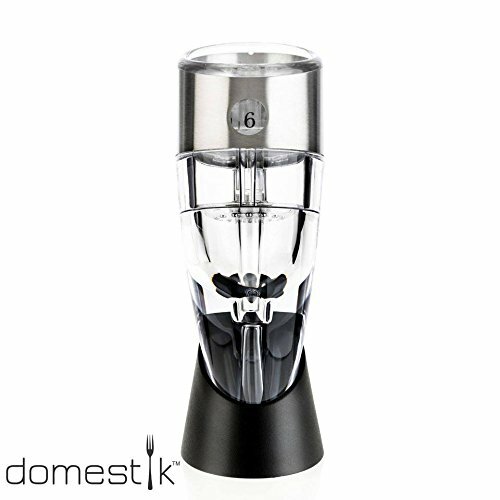 I recommend the Domestik Adjustable Wine & Spirits Aerator. It is an excellent product and the good folks at Domestik have been kind enough to offer a discount code for my readers. Just visit this link, http://amzn.to/1SbzDRQ and enter the code WHKING20 for a 20% discount. I think the Domestik Adjustable Wine & Spirits Aerator would make an excellent gift for any whiskey enthusiast that enjoys experimenting with the many personalities of whiskey.